Welcome to the Laura Antoniou online shop! This is the place to buy signed Laura Antoniou books directly from her stock. The Marketplace series of novels is all here, including The Inheritor, book 6 of the series. You can also get TWO volumes of No Safewords, the collection of Marketplace fan fiction! 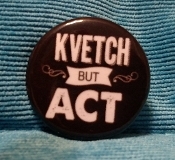 Special, exclusive items can only be purchased here! 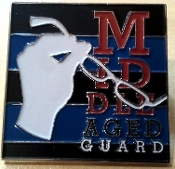 If you're a proud member of the Middle Aged Guard, get the OFFICIAL run pin! Or perhaps you're more interested in asking yourself - and others - What Would Chris Parker Do? and a leather pride yarmulke to show the world you're a true LeatherMensch. Check back here regularly for older editions and rare finds, posted when available. Leather Pride Yarmulke (Kippah) PRE-ORDER Avadim Hayinu: The Leather Seder BACK IN STOCK! Leather wristband USB drive loaded with e-books!